First Impression: Hip, alternative and progressive, Northside is where artists, musicians, social activists and creative types of all kinds flock to live, work and play. Unabashedly liberal, Northside is pro-music, pro-art, pro-small business and pro-gay. It's home to some of Cincinnati's best independent music, arts and restaurant offerings, while still retaining a strong community and hometown feel. Second Look: Northside is a gem in the rough - on the surface, this small neighborhood may look slightly intimidating to an outsider; the buildings are older and often weathered, and the local dress code tends toward piercings and tattoos. Look beyond appearances, however, and you will find one of the most hands-on and tightly knit communities in town. Northside is also a neighborhood with a great deal of self-pride. If you keep an eye out, it won't be long before you spot an "I ♥ Northside" bumper sticker, which find their way all over the city. 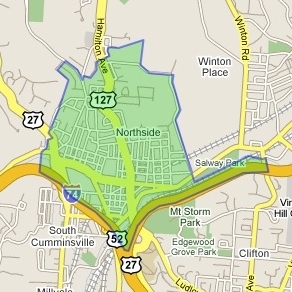 It's true, residents and frequenters of Northside DO love Northside, and for good reason. Besides the lively entertainment scene (some of the city's most unique eateries and music venues have their home in Northside), what really sets the neighborhood apart is its "DIY" (Do It Yourself) attitude; it boasts a wealth of social justice, arts and community organizations. The Northside community council is one of the largest in the city with more than 200 members and promotes grass-roots support of safety, health, business and the arts. Other progressive groups Northside citizens have created include: the MoBo Bicycle Co-Op, Northside Citizens on Patrol, Gay and Lesbian Community Center, Women's Research Center, Northside Arts Organization and the Northside Farmers Market, to name just a few. To give an idea of why folks love Northside - here is what an average day off in the neighborhood could look like; you can spend the entire day exploring and enjoying a variety of venues, without getting bored and all within easy walking distance. Morning: Have breakfast and check email at the corner coffee shop, go for a stroll in the park, browse through the eclectic and outstanding collection of albums at an independent record shop. Afternoon: Have lunch in a veggie-friendly open air rock garden, kick back for a while in the public library, pick up a foreign film at the independent video store, shop for fresh produce at the market or plant/harvest your own in the local community garden (season permitting). Evening: Take your bike to the nonprofit co-op for free parts and maintenance advice, get some exercise at a Yoga or Tango class, check out an art opening and socialize with the artists, grab a bite and a beverage at the local watering hole and see a live original band perform. Though somewhat rugged in looks, Northside is an area with a lot of passion. Unlike some places, where there is a more polished and welcoming feel, Northside requires a little effort to get to know - this neighborhood is essentially what you make of it. The result, as many Northsidians and Northside converts can attest, is worth the effort - though they are just as happy to continue on as they are and let Northside remain one of Cincinnati's quiet treasures. Like a diamond in the rough, it's up to the visitor to find the value in Northside's many facets and to shape them to his or her design. Let us know about neighborhood people, stories, events and other info you'd like to share. James Heller-Jackson is a resident of Northside who tweets about the neighborhood, his kids, his partner, local business, GLBT news and life in general. Northside gets shout-outs from the New York Times: "The Northside district has recently blossomed into a casually hip destination for shopping and night life, particularly along Hamilton Avenue." Northside, five minutes from downtown Cincinnati, brings a small-town look and mentality into the city, with its old-fashioned houses, farmers markets, independent shops, and strong community activism. It further sets itself apart with two hilltop nature preserves.